The 828 ORCA design by Specmar has a large cabin with full standing headroom and a spacious aft deck with build in fish holds, ideally suited for a variety of water sports as well as commercial applications. The hull shape and overall dimensions make this boat also suitable for extended trips and overnight accommodation. 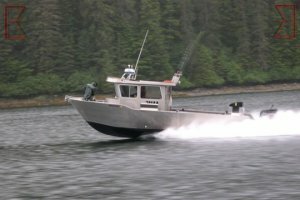 Propulsion is with either single or twin outboard engines, depending on speed requirement. Two separate fuel tanks of each 220 liter are included. The planing hull shape and Construction are capable of powering this boat with up to 350 hp, giving her maximum speeds of up to 60 km/hour and cruising speed of approx 45 km/hour. The design and construction are laid out for coastal water usage and comply with CE-category C.
As with most Specmar designed hulls, the construction is sturdy and robust with a combination of longitudinal and transverse framing. The integrated “spray-rails” in the outer hull provide a unique combination of hull strength and streamlined outlook. The Specmar patented “Delta Skipad” in the bottom Construction ensures a high stability and excellent sailing and handling characteristics. De design and kit has been adapted and modified by Bruce Roberts Europe bv to comply with most European codes and rules, as well as production standards. The Bruce Roberts Europe pre-cut building kit consists of extremely accurate cut plate parts including precision markings and pre-forming of all parts. A comprehensive set of assembly drawings and instructions compliment the kit ensuring efficient and fast assembly of this boat. Optional extras such as marine windows and doors are also available from Bruce Roberts Europe.